The highly controversial round-up of hundreds of wild horses in Nevada is on hold after seven horses died due to insufficient water. The Tuscarora gather was suspended by the Bureau of Land Management (BLM) until they can assess the conditions and plan how to proceed. 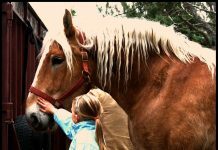 The gather began on July 10 and over 300 horses had been brought to a BLM holding area where they were given hay and water. 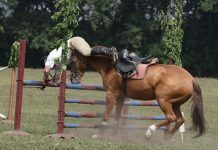 On July 11, four horses were found dead and several were exhibiting symptoms of colic and brain swelling, which can occur in animals that have had large quantities of water after a period of dehydration. As of July 13, there had been 12 equine deaths during the short round up, most of them due to dehydration or related issues. 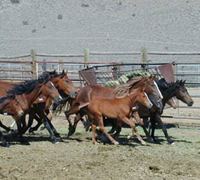 Opponents of the BLM’s mustang round-ups have filed a lawsuit in relation to the Tuscarora gather, alleging that the BLM’s actions violate the federal laws that protect wild horses. Wild horse advocates argue that conditions are too hot at this time of year, and that it is too close to foaling season to disrupt herds that include newborn foals and pregnant mares. Currently, there is no set timeline for continuing the round-up, but the BLM does not plan to abandon it altogether. Although the round-up is temporarily halted, the BLM is monitoring the herds that still remain wild in the area as there is concern about the drought conditions. The BLM has installed six water troughs, filled by a water tanker, as an emergency measure. The horses that were already brought in during the first few days are receiving hay, water and veterinary care. I am absalutly done with the BLM! They are cruel and inhumane the horses are called WILD horses for a reason! I think it should be on national news. At 66 years of age I am always encouraging everyone I meet to “pick a cause” and make a statement. I think the government should stay out of federal land management. The “wild” was doing fine until people came along. If I had the money I would just buy the land for the horses….money well spent! ARGHHH – the BLM did it again! Thanks for sharing and I hope the news goes far. So sad. Since when is it acceptable practice to move herd animals in the heat of the summer? Ask any farmer/rancher – fall and spring – COOL weather is when they are moved. Where were these people schooled? Sure as heck wasn’t on the farm or ranch!!! Why can’t the mustangs just stay wild? I see nothing wrong with that. Horses were meant to be wild anyway, so they’d be happier and healthier out there. Can’t we leave SOME land not built on?? Why do humans insist on living on every square inch of this planet?? The animals were here before we were!!! I am sickened by the Governments determination to eliminate the wild horses. I love to see the wild horses and enjoy seeing the babies on my trips to town. They are a symbol of the Wild West and we as Americans and our Freedom. Just like they are trying to take the freedom of Americans they are trying to take the freedom and lives of the wild horses. I ride a Mustang, and I love them more than anything. This makes me extremely mad! Treat the wild horses with the same love and respect you would the fancy show horses! My Mustang was born in the wild, and rounded up while still a foul. All of my horse career will be dedicated to the Mustangs, and hearing of this… well it makes me more than sick. Wrong, wrong, to kill off the nations landmasses of wild herds who belong to the people! This is awful. Rounding up horses in 100 degree heat? I’d like to see the ranchers run their cattle for 9 miles in 90 degree heat and see how many survive. BLM, late as always, now provides a bit of water, suprising. They think this little effort will make the horses more stable for another 9 mile run in 90 degree heat? When will this mismanagement be accountable? Do not remove the Mustangs and Burros and then put an open pit mining operation in its place or an other billion dollar projects (Ruby Pipeline for one) that benefits the BLM, not the Mustangs and Burros.